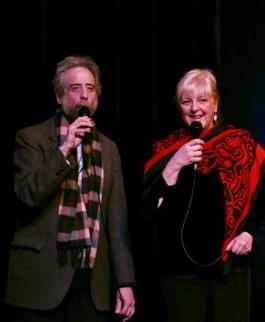 Lawrence Howard and Lynne Duddy, Founders, Portland Story Theater. Photo by Scott Bump (2016). Your kind Donations are appreciated. Portland Story Theater is a passionate advocate for diverse narrative and our loyal listeners. We are a 501(c)3 charitable organization. Contributions and sponsorships facilitate outreach and keep ticket prices affordable. As an advocate for the narrative art of storytelling, Portland Story Theater strives to broaden audiences, develop new approaches, and support existing and new storytelling programs. When you donate, you’re making a difference. Click here to donate today! Not everyone can afford to take a workshop and we provide scholarships whenever we have funding available. If you would like to support others in their experience of this amazing art form, please make a donation today! Want to be a part of an exclusive group of people who get together to celebrate story, participate in super cool events, and just have fun with other story lovers? Click here to learn how! Support the mission of Portland Story Theater by planning a legacy gift through your will or trust. Click here to learn more.